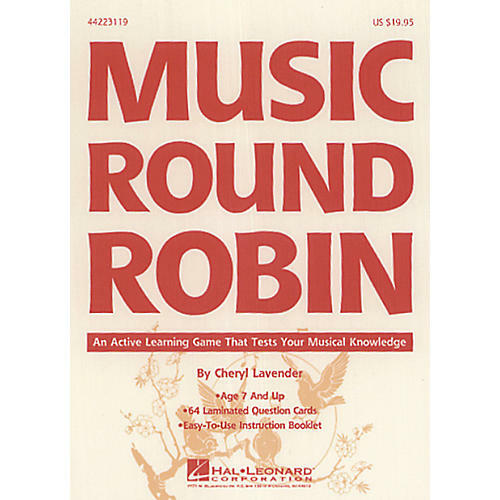 The quick-paced Music Round Robin game from Hal Leonard helps whole-groups of music students reinforce and assess acquisition and retention of musical facts. Consisting of a total of 64 cards: 32 cards feature pre-printed musical facts geared toward Grades 3-6. The students progress through the easy-to-follow question/answer format as quickly as they can within a designated time limit. The other 32 cards are left blank so you can create your own set of Music Round Robin questions to help reinforce your unique course of study. Best of all, all 64 cards are laminated on both sides for durability and can be used with wipe-away dry erase markers. With a whisk of a tissue, you're ready to create your next unit's Music Round Robin. Each time the game is played your students try to beat their last record, but rather than being a "competitive" game, students actually are encouraged to work together as a group. Reward their group effort with the playing of favorite records, a musical "choice" day, stamps, stickers, or other appropriate rewards. This is a classroom-tested resource that you will use over and over again. Let your students "take the music challenge" of Music Round Robin today.